Resilience. Bouncebackability. Two words to describe what was needed last night, for Warwick/Kenilworth to reassert their control of their division. With tough looking away fixtures to come at Nottingham and Pontefract, and their lead chopped to 6 points after their first defeat of the season in the last round of matches, it was imperative that a big win was achieved against Bristol. Realistically, this match was going to be won and lost lower down the order. In the top 2 strings, the WarKens were simply had too much firepower at their disposal for Bristol. Pajares too quick and agile. Kandra too powerful, too much guile. That’s not to say that the Bristolians didn’t put up a tremendous fight, indeed Conroy pushed Pajares hard, but ultimately Warwick/Kenilworth did take these two rubbers, 2-0. No. This match hinged on battles elsewhere. Could Warwick/Kenilworth sneak another rubber? On paper they should do, maybe all three, but each match-up had its dangers and so it proved. Fuller, at 3 string going down 2-1 against street-smart Mike Harris. Nevertheless the game and therefore point he won for it, will no doubt prove valuable in the final reckoning. 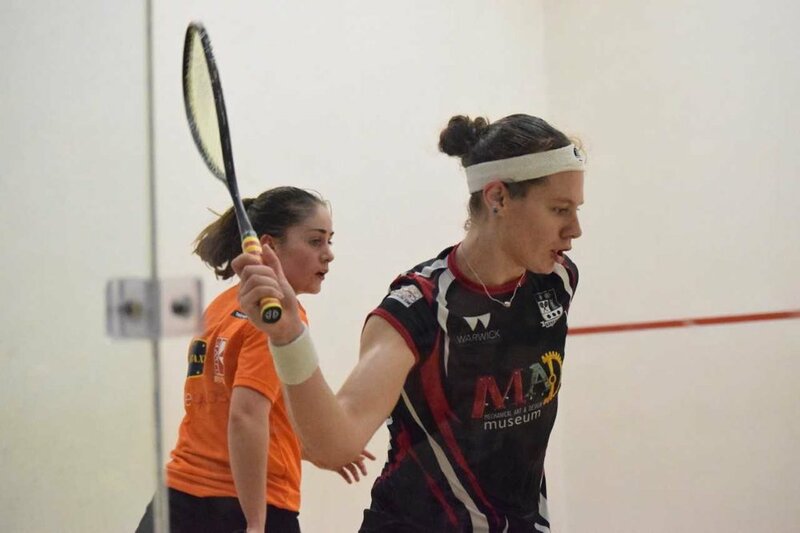 Julianne Courtice was playing her 4th match for the WarKens, deputising again for the almost back from injury, Sarah-Jane Perry. Courtice had previously only played players ranked in the World top 20, and was yet to register a win. This time though, she was the big fish, playing one of the PSA World Tour up-and-coming players to watch. Roles now reversed, but pressure firmly on. Julianne knew this was her chance, at home on the show court, in a must win match. She stumbled in the first, metaphorically, but came through a tight second 11-9, which thankfully, was the turning point. More comfortable in the 3rd, the relief to get an invaluable first win under her belt was very evident in her body-language post match. On the adjoining court, Harry Falconer was repeating his win from the reverse fixture against the dangerous leftie, James Peach. This time in 2 rather than 3 games. Nevertheless each game was very close and the result in the balance until the final winner was struck. These two wins left Kandra and Pajares to finish the job and secure 12 out of 13 points for the WarKens. “This is exactly what we needed. Business as usual, and a very professional performance. We’re really happy with 12 out of 13 points against this dangerous and unpredictable opponent. It gives us a very strong platform to approach the upcoming season defining matches and we can’t wait!” said, a jubilant team manager Steve Townsend. With nearest challengers Birmingham faltering, it leaves Warwick/Kenilworth with a very handy 14 point cushion at the top of the table, with 3 matches of the regular season remaining. 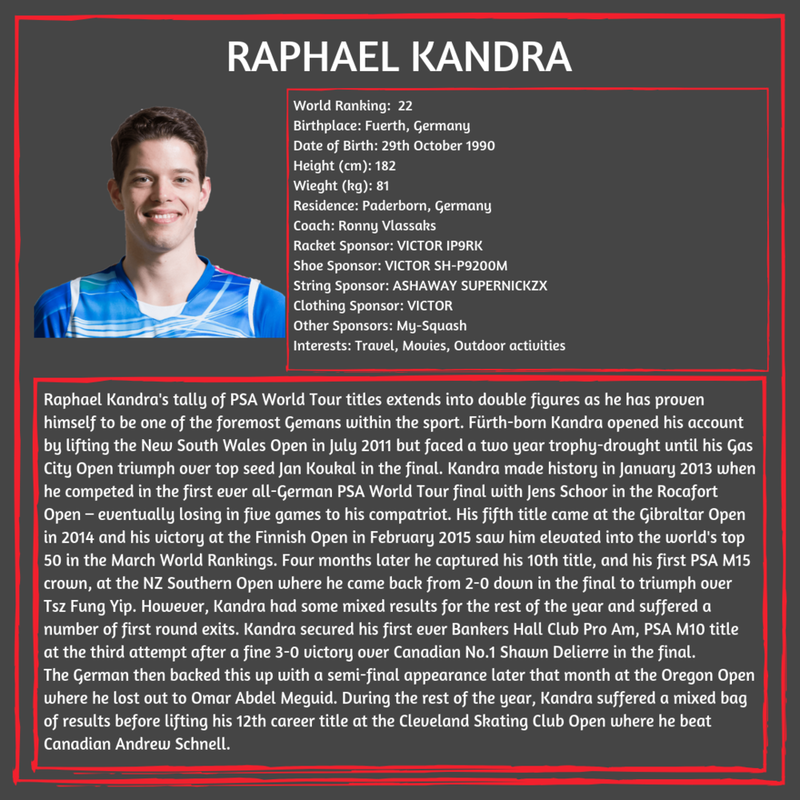 We’re looking to extend our lead at the top of the table, and the team will feature Raphael Kandra World number 15! Victory would take us a long way to securing a semi-final berth, so it is certain to be jaw-droppingly good squash – well worth the £6 tickets!! If you haven’t been to a PSL game yet, we urge you to come along and experience world-class squash so close to home! Any questions, or if you wish to volunteer and help out at the event (you get a free ticket out of it! ), please contact either Steve Townsend or our PSL Secretary, Finn Meinecke. Tickets are now live for our next PSL Match (6th November) vs Nottingham University. The match will feature Iker Pajares v Declan James and Raphael Kandra v Nick Matthew! This is a massive match and one not to miss out on! Follow the link below so you don’t miss out! Get them quick, as they are likely to sell out quickly! Albeit only the second match of the season, The University of Warwick/Kenilworth Squash Team were looking to extend their unbeaten start to the season in the England Squash show piece Premier Squash League, with a tricky looking fixture down in Bristol last Tuesday. Last season saw the team punching above their weight with a young team playing well above their individual rankings taking some memorable wins, and the team to the verge of the play-offs. This year the team want to go one better, reaching at least the play-offs and hopefully further still. With this in mind the summer has seen Steve Townsend, team coach and manager busy recruiting to strengthen the top and middle order and this trip would be a good test of the sapience of that recruitment. The Warwick/Kenilworth team boasted new signings Baptiste Masotti, world number 76 from France, playing at number 3, and at the top of the order Raphael Kandra, the German sensation world ranked 19. This strengthening put the WarKens, as they are affectionately known, as slight favourites on paper, however the best of 3 sets format is a bit of a leveller, so nothing, especially at this level could be taken for granted. 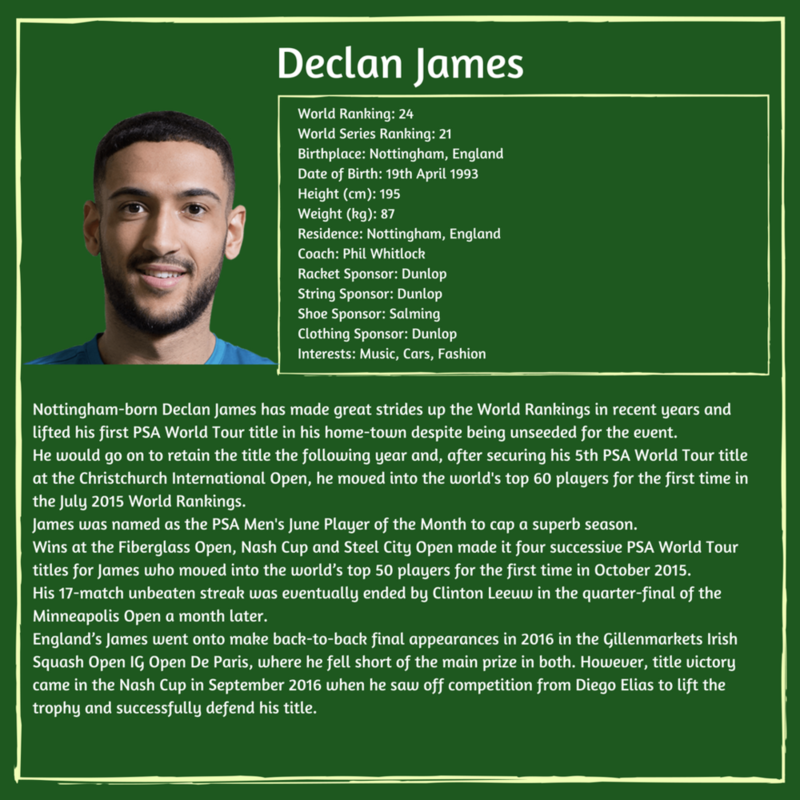 And so it proved, with WarKen Harry Falconer, who was without a win last season upsetting the applecart, the formbook, and the home crowd, with a tremendous victory over fellow former England Junior International James Peach 2 games to 1 after losing a tight first game. Baptiste Masotti next up was a strong favourite at 3 string, playing home favourite Mike Harris. Harris is no respecter of ranking though, and proceeded to knock Masotti completely out of stride and out of sorts. 1 down and down in the second a Gallic shrug of the shoulders told you all you needed to know about the “what is going on here?” mind-set of the typically flamboyant French. 3 tense match balls saved with his fate decided by the referee on at least one occasion, he came through his very sticky, sticky patch to race through the 3rd set and give Warwick/Kenilworth a 2-0 lead. Surely that would be the potential banana skin of the evening avoided? Not a bit of it. Julianne Courtice acquitted herself well against powerful World ranked 14 Joshana Chinappa, but went down 2-0. Iker Pajares, so solid and dependable previously, was suffering from illness and completely ran out of steam in the crucial 3rd game. This of course led to a 2-2 score line in rubbers, with just the 1st strings to play. No pressure on Kandra then, making his debut, with the match very firmly resting on his very substantial shoulders. Up to this point Warwick/Kenilworth had lost every single first game of each rubber. Yes, of course it happened again. So from 2 rubbers up and cruising, they were now 2-2, and 1 set down in the decider. Coach Townsend will surely have to right this wrong if the team is to go deep in this competition. There’s a reason though why Townsend signed Kandra, why Kandra ended Nick Matthew’s career in unsentimental fashion in May and why he’s World no 19 and rising. Three reasons actually. Speed, skill and power. Kandra started to take control of the “T” with simply breath-taking speed of thought and deed. The power across the middle of the court, and feather like touches into the front ultimately gained control of his opponent and the scorecard, running out 11-7 winner in the final game of the final match. So a much relieved Townsend and a delighted team welcomed the newbie Kandra into their team as the hero of the evening. 2 from 2 then and Crackley Lane will welcome Nottingham, the 2017 champions who seldom lose, on the 6th November. Nick Matthew is expected to turn out for Nottingham to face our new hero Raphael Kandra. Sarah-Jane Perry will return for the WarKens. Tickets will be much sought after, will be available through the Warwick Arts Centre website in the next few days. Warwick/Kenilworth players Ali Farag and Sarah-Jane Perry take the Oracle NetSuite Open by storm! Last week in San Fransisco Ali Farag and Sarah-Jane Perry defeated Mohammed Elshorbaggy and Raneem El Welily in their respective finals of the Oracle NetSuite Open. What a win for Warwick/Kenilworth in the first match of the season against the University of Birmingham on Tuesday evening! In her first game Julianne Courtice (WR#48) stormed back from 5-10 down to take the first game 13-11! However, Millie Tomlinson (WR#27) from Birmingham brought it back to 1-1 for the final game…Despite a hard-fought match Birmingham got themselves an early lead as Tomlinson took the final game 11-9. Meanwhile, on court 1 Guy Pearson, a late addition to replace Nick Wall, stepped up to the mark against Birmingham’s Stuart Macgregor (WR#218). Despite a close start, Guy just couldn’t keep up with Macgregor and lost the first game 11-5. Going into the second game Guy took an early lead but despite his valiant effort lost the second 11-9 – making it 2-0 to Birmingham. It looked like the Warwick/Kenilworth team were at a loss. It was then up to the top three seeds to bring the win home for the team. 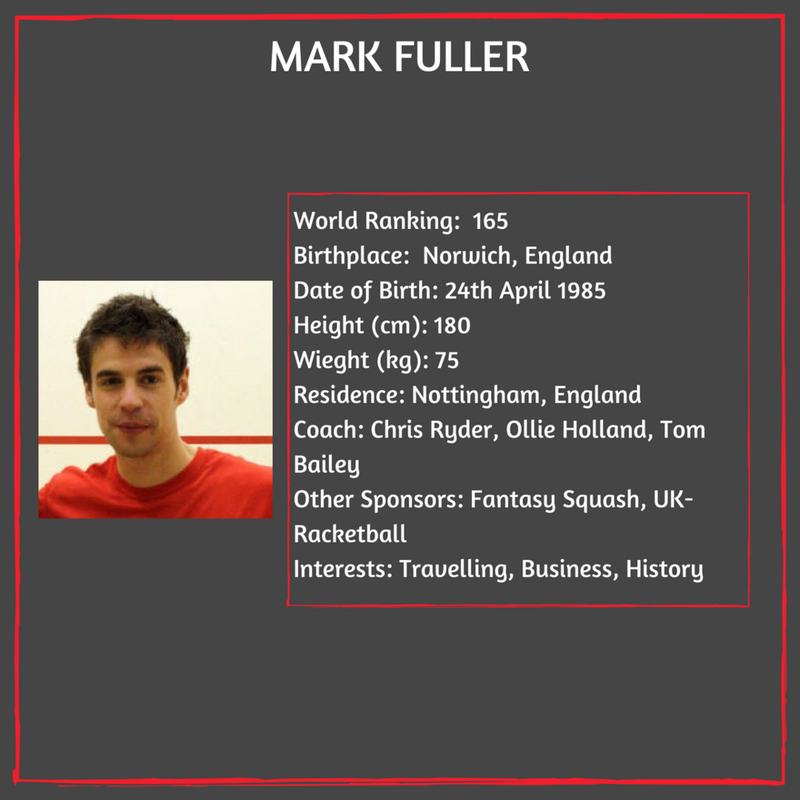 It was Mark Fuller’s (WR#185) time to shine and with a swift victory over Birmingham’s Jonny Harford; 11-6, 11-8 brought the Court 1 matches to an early finish. On the show court Mahesh Mangonkar (WR#68) was warming up to face Jaymie Haycocks (WR#113) of Birmingham. Mahesh stormed to victory over Birmingham and levelled the score 2-2. With an even score going into the final the hopes of a Warwick/Kenilworth victory rested with Iker Pajares (WR#58). However, it was a slow start for Iker and Birmingham’s Jan vd Herrewegen (WR#75) took an early lead taking the first game 11-4. But it was not over for Warwick/Kenilworth, in a monumental comeback Iker took the second game 11-5. Everything rested on the final game – but there was no knocking Iker’s form now he took the last game 11-5 and won the match for the Warwick/Kenilworth team 3-2! Our first PSL match is almost upon us and tickets are available now! On 25th September the Warwick/Kenilworth Team will be facing of against the team from Birmingham University at 7pm at Kenilworth Squash Club! Last year nearly every match sold out so book now to avoid disappointment. Show court: Standing £10, terrace seating £12, premium seated £20. Please note that you will only be able to watch the matches being played on the court that you purchase tickets for - all matches will be playing on the big screen in the bar throughout the evening. If you wish to purchase a ticket please go to the Warwick Sport Reception or call 02476 523011. Thank you to those volunteers that have already put themselves forward - if you would like to volunteer at matches please contact Finn Meinecke to register your interest! The nail-biting fourth game from the Allam British Open Final 2018 in Hull between Marwarn Elshorbaggy and Raphael Kandra. After making his way through qualifyers, number 37 in the world, Kandra knocked out Nick Matthew and Marwan Elshorbaggy only to lose to Miguel Rodriguez in the Semi Finals, who went on to win the tournament. PSL is back with a bang! Our first match of the season is taking place at our home club, Kenilworth Squash Club, on the 25th September. Come along and show your support for our players as they take on the Birmingham Lions! For those of you who missed out on last weeks PSL...here is the post match interview with WarKens very own Ali Farag! Here is what the current world no. 3 had to say after his debut win for the team!